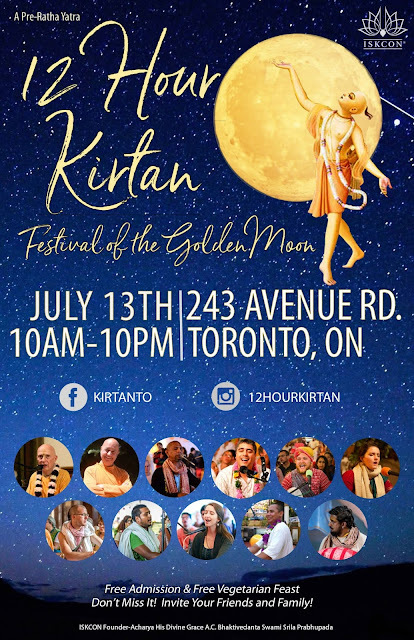 Festival of the Golden Moon - 12 Hour Kirtan! ~ The Toronto Hare Krishna Temple! Festival of the Golden Moon - 12 Hour Kirtan! The much-awaited annual pre-Ratha-Yatra 12-Hour Kirtan is just a few weeks away. Featuring kirtan leaders from around the world, this is certainly a day not to be missed! Being held on Friday, July 13th from 10am to 10pm at the Toronto Hare Krishna Temple at 243 Avenue Road, it promises to be the best 12 hours of your life! World renowned kirtanyas will be descending on Toronto from around the world, including Madhava Prabhu from Switzerland and Amala Kirtan Dasa from Brazil and many more! Make sure you come early as your favourite kirtanya might be chanting earlier than you expect! Don’t forget to invite and bring your family and friends on Friday July 13th, 2018. We look forward to seeing you there! All will be revealed in the coming weeks! Join us tomorrow for a special presentation about this year's festivities! Ram Ram Hare Hare !!! Can we know the schedule of the kirtanyas?